Whether you need a certain version of iOS, or a particular utility or program to jailbreak your iDevice, this section will certainly be helpful for whatever you seek. Download iOS 7.0.2 Firmware For All iDevices – Apple has released iOS 7.0.2 firmware for iPhone, iPad and iPod. 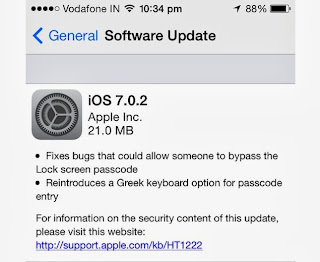 Apple has released iOS 7.0.2 to fix several bugs like Lock screen bug. Lock screen bug was the main trouble with iOS 7 as it was possible to make calls and access photos contacts Facebook and personal data with the locked screen. Apple has fixed lock screen bug with iOS 7.0.2. Download iOS 7.0.2 IPSW Firmware for iPhone, iPad And iPod Touch from the links below after the jump. 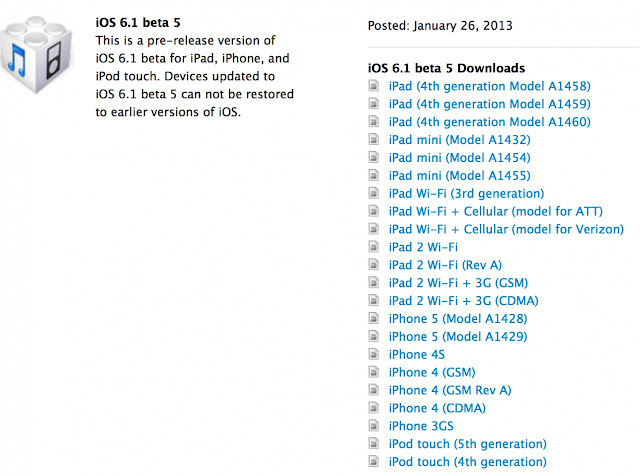 Download iOS 6.1 Beta 5 For iPhone, iPod touch and iPad. 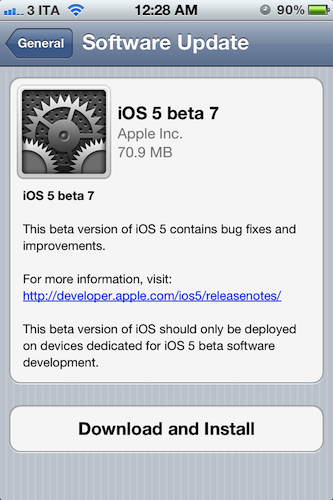 Apple has released iOS 6.1 beta 4 the last version of iOS few weeks ago. Most of Apple fans are expecting that Apple will release the GM version of iOS after the current one. The surprise came unexpected and Apple has released fifth beta of iOS 6.1 for iPhone, iPad, and iPod touch for developers. Read more after the jump. Download iOS 6 IPSW final version for all idevices from the links below. iOS 6 final version have new amazing features and options. 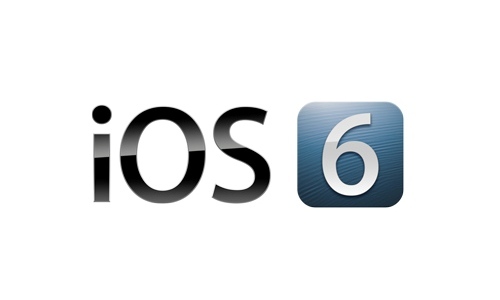 We will cover you with all details about iOS 6 features but now Let’s download iOS 6 Final version for all idevices from the links below. Day after day, we are interested to see iPhone 5 and can't hardly wait for it's launch. Today Apple has released iOS 6 beta 4 build 10A5376e for iPhone, iPod Touch & iPad. 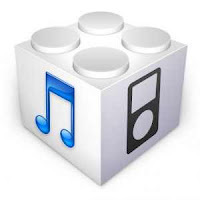 Download iOS 6 Beta 4 IPSW firmware for all idevices from the links below. Considering that the fourth beta is upon us and the clock is ticking on a possible release date, Apple will be hoping that each release to developers will bring with it a more stable and noticeably enjoyable iOS 6 experience. With iOS containing some substantial upgrades for the 6.0 release, with one of them being the inclusion of a whole new 3D-enabled mapping system. 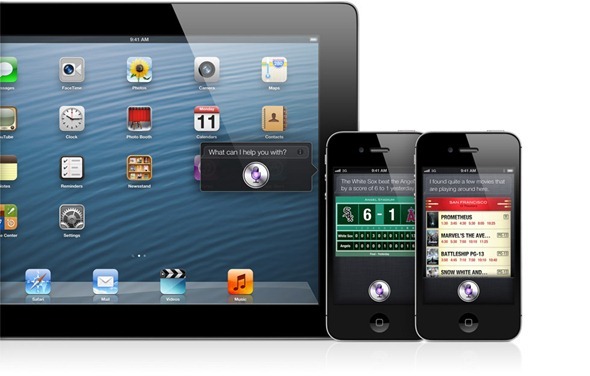 Previously, we reported you about Apple's big event WWDC 2012 to introduce iOS 6 with new native features. Today a Chinese forum has picked a leaked download links for iOS 6 beta 1 and it represents a big surprise. You can find download links below but these links are not active now. Keep in touch with us and we will sen you download links as soon as they release. Well, Apple has released iOS 5.1.1 IPSW Firmware for iPhone 4S, 4, 3GS, iPad 3, 2, 1, iPod touch 4G, 3G. You can download iOS 5.1.1 for all idevices from the links below after the jump. Finally, Apple has released the final version of iOS 5.1 IPSW firmware officially for iPhone 4S, 4, 3GS, iPod touch 4G, 3G, iPad 3, 2 and iPad. Apple has released iOS 5.1 IPSW firmware which brought many new features and to fix many issues. Download iOS 5.1 IPSW firmware for all idevices after the jump. 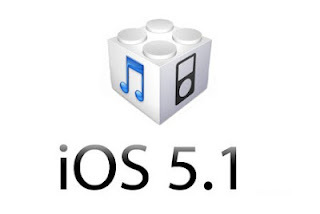 Yesterday, Apple has seeded iOS 5.1 beta 3 IPSW firmware for iPhone 4, iPhone 3GS, iPod touch 4G, 3G, iPad 2 and iPad. iOS 5.1 beta 3 still available for developers only on Apple dev center and official web site. Download iOS 5.1 beta 3 from the links below after the jump. Apple has seeded iOS 5.0.1 firmware build 9A406 for iPhone 4S. 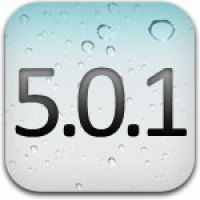 Apple presented a new build of iOS 5.0.1 for iPhone 4S and Apple TV 2G with build 9A406a to fix many bugs. You can download iOS 5.0.1 9A406 for iPhone 4S and iOS 5.0.1 9A405 for iPhone 4S, 4, 3GS, iPod Touch, iPad 2 and iPad from the links below after the jump. 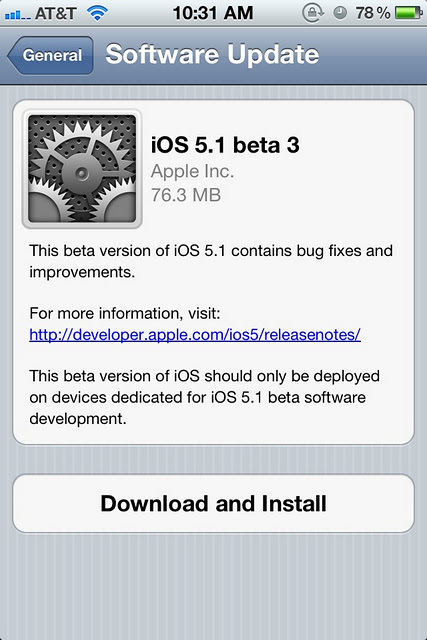 Yesterday, Apple has released iOS 5.1 Beta 2 for developers. iOS 5.1 Beta 2 has been updated to facilitate photos management in photo stream. You can download iOS 5.1 Beta from the links below after the jump. Most of our fans are asking us how to downgrade from iOS 5.0.1 to iOS 4.3.5, iOS 4.3.3 and other old firmwares. So we will show you how to downgrade your iPhone 4, 3GS, iPod Touch 3G, 4G and iPad from iOS 5.0.1 to iOS 4.3.5, iOS 4.3.3 and any old firmware in this post step by step. Check the guide after the jump. Why iOS 5.0.1 Is Undesirable ? 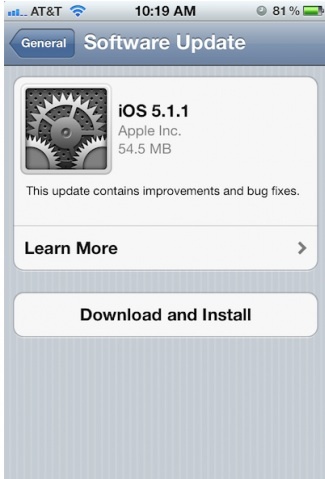 Few days ago, Apple has released iOS 5.0.1 with new changes and features. 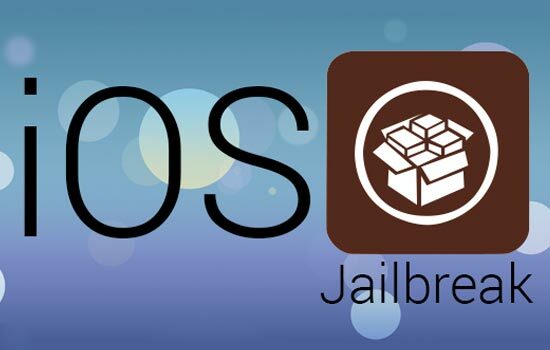 We advice not to update your current firmware to iOS 5.0.1 if you would like to jailbreak your iDevice as it is so hard to jailbreak you iPhone, iPod and iPad when running iOS 5.0.1. Before yesterday Apple has released iOS 5.0.1 Beta to fix many problems like battery life drain. Apple has released a new beta version of iOS 5.0.1 Beta 2 which is available for developers only. Now you can download iOS 5.0.1 IPSW firmware for all idevices ( iPhone 4S, iPhone 4, iPhone 3GS, iPod touch 4G, iPod touch 3G, iPad 2 and iPad ) direct links here below . This update brings back multitasking gestures to iPad and fixes battery life drain. Well, Facebook has finally released new app for iOS 5 firmware with more than 12 language. 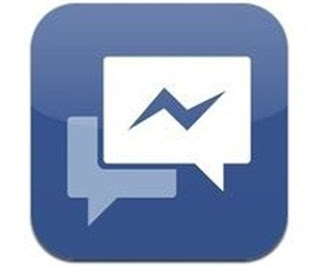 This new app allows users to use Facebook chat box in their mother language. let's see what is else new on the new Facebook app but after the jump. 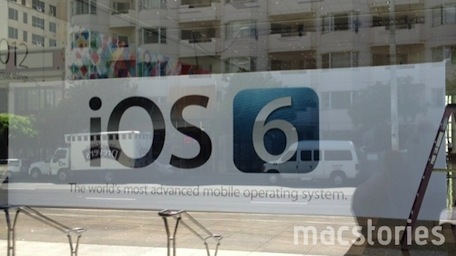 Finally, Apple has released the final version of iOS 5 for all iDevices. iOS 5 has brought more than 200 new features like newsstand, Twitter integration, iMessage, Reminders, and more. You will find iOS 5 supported devices and download links after the jump. 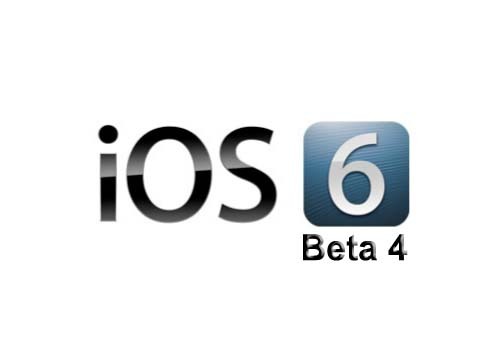 Well, Apple has released iOS 5 beta 7 for developers, iOS 5 beta 7 ipsw firmware supports iPhone 4, iPhone 3GS, iPod touch 4G, 3G, iPad and iPad 2. Well, Apple has just released iOS 5 beta 6 ipsw for iPhone 4, iPhone 3GS, iPod touch 3G, 4G, iPad and iPad 2 in the Dev Center. iOS 5 beta 5 has been released two weeks ago and iOS 5 beta 6 now available.You can download it from the link below after the jump. Apple has launched iOS 5 beta 5 ipsw firmware for iPhone, iPad, iPod touch and Apple TV in the dev center.This is the build number 9A5288d for iOS 5 Beta 5.